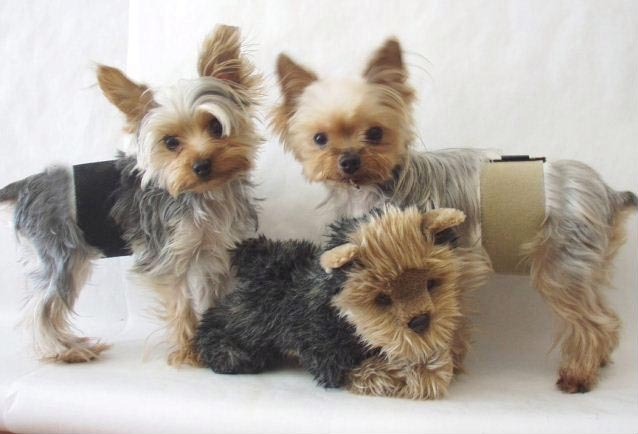 Our male diapers were originally created for little male dogs who mark. 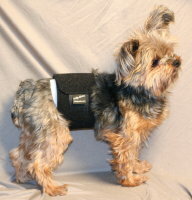 Over the years, due to demand, we also developed larger sizes for big dogs with incontinence problems. Unique Accessories,Inc. 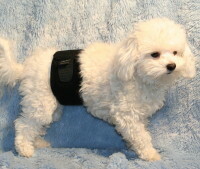 "Invented" the Very First Male Doggie Diaper back in the early 80's. There are NO OTHER Male Diapers on the market, that "fit perfectly" and "perform" like Ours. The Diaper itself is made of a soft cut-able fabric that insures a perfect fit! Our diaper goes only around the tummy area like a cummerbun and uses Velcro to fasten. Easy on Easy off! MALE DOGGIE DIAPERS are completely washable and re-usable. The MALE DOGGIE DIAPER uses adhesive pads inside, so when your dog has a "mishap", it goes into the pad, not on your carpet or furniture. When the pad inside gets full, usually once a day, simply remove pad from the diaper, throw it away and stick on a new pad! You can purchase the pads from your local grocery store. 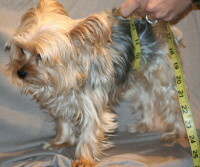 To measure for the MALE DOGGIE DIAPER; Start on top of back, go under tummy right over is "little thing" then back up to the top where you started. It's like a circle around his middle. Determine the correct size below Then choose that size on the drop down menu Hit "add to cart" it will take you to your shopping cart page then you can choose the qty.